We have a limited number of digital clocks. Come early to secure one for your game. 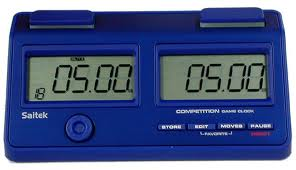 Clocks are usually used in competitive chess challenges between schools. Therefore, their use in friendly club games is important prior to competitive games. Clocks challenge you to think more quickly and gain a critical time advantage over your opponent. If you run out of time in competitive chess, you lose the game. Come early to get a seat. Enjoy your lunch while playing chess. Leave the room tidy. New players welcome. Mondays 4-5 pm for all interested in learning chess or improving their game. Students who attend after-school chess on Mondays can play during lunchtime on both Tuesdays and Fridays.